2017 Goji Harvest is bountiful and delicious! We provide many botanicals in whole form and as water soluble extract powders and liquids and are perfectly suited for any application; food, cosmetic and nutraceutical. Of the many varieties of Lycium, the Tibetan Lycium berry has earned the respect of the great Physicians of Tibet over these many centuries and has been coined with the name ‘Goji’. It grows in remote unpolluted hills and valleys of Tibet and Mongolia, in soil so rich in nutrients that the berries are exploding with nutrient rich vitality. Here are just a few ways Goji supports a healthy life. Rich in phytonutrients, antioxidants, particularly carotenoids such as beta-carotene, zeaxanthin and others. Test studies are showing that Goji berries may prevent the growth of cancer cells, reduce blood glucose, and lower cholesterol levels. 18 amino acids, 21 trace minerals, 6 essential fatty acids, vitamins B1, B2, B6, Vit. E and more antioxidant power than any other food! – Tufts University study. Low in calories, fat-free, a good source of fiber, a high-antioxidant food, has a wide range of phytonutrients, vitamins and trace minerals, putting Goji the in the category of “superfood”. The Journal of Alternative and Complementary Medicine, goji berry benefits include increased ratings for energy levels, athletic performance, quality of sleep, ease of awakening, ability to focus on activities, mental acuity, calmness, feelings of health, contentment, and happiness and significantly reduced fatigue and stress. They’re a great source of antioxidants and phytonutrients that help protect skin and eye health. Thanks to their ability to reduce blood glucose, regulate cholesterol levels and keep triglycerides at an ideal balance, they’re also shown to prevent heart disease. Goji berries help increase your ability to fight disease, effectively manage your weight and experience better digestion. Usually eaten raw, dried, or in liquid and powder form. Over 20 other trace minerals including zinc, iron, phosphorus and riboflavin (vitamin B2). Ounce for ounce, goji berries offer more beta-carotene than carrots and more iron than soybeans and spinach nutrition, which makes them a great source to help stave off iron deficiency! It’s rare for a fruit to also provide Amino Acids, Goji has 18 and especially 11 types considered “essential” that the body can’t make. Another goji berry benefit to consider is their convenience, nutrient density coming in a small package that is easier to eat then the amount of fresh fruit for the same amount of nutrients. For example, when you compare goji berries and oranges weight for weight as vitamin C foods, goji berries provide up to 500 times more vitamin C! They have a delightfully chewy texture and their flavor is like a cross between cranberries and cherries. They look similar to raisins since they’re normally dried, but they have a brighter red color and a special sweet/tart “bite” to them. Goji berry benefits also extend to other parts of the body thanks to their polysaccharides and glycoconjugate compounds that promote unique bioactive immunomodulating, anti-tumor and antioxidant activities in the brain, liver, reproductive organs and digestive tract. Did you know you could help fight skin cancer with food? Goji’s are reported to have anti-aging properties and show anti-tumor activities against various types of skin cancer cells by inhibiting tumor growth and inducing apoptosis. In an animal study done by the Faculty of Veterinary Science at the University of Sydney, adding goji to the diet supplied antioxidant activity that offered significant protection against skin disorders and lipid peroxidation of UV light damage. Two known endogenous skin antioxidants are present in goji berries, heme oxygenase-1 and metallothionein, which were found to be involved in the photo immune protection. The results show that using goji berries dried, juice or powder increases your protection against free radical damage from the sun. Goji provide additional photo protection for people who are susceptible to skin cancer and other skin disorders. One study published in the American Academy of Optometry’s Optometry & Vision Science journal found that using goji berry daily as a dietary supplementation for 90 days increases plasma zeaxanthin and antioxidant levels significantly, which protect eyes from hypopigmentation and accumulation of oxidative stress compounds that can damage the macula. Other studies show that the goji berry benefits eye health by protecting the retina from ganglion cells so goji antioxidants act as a natural treatment for glaucoma. Goji berries are believed to offer liver protection and are used along with traditional herbs like licorice, ganoderma, gynostemna and pentaphylla in many liver cleanses. This is one reason they’re commonly used as a tonic ingredient in soups and to make sweet or savory porridges for people who are sick. They’re thought to be one of the best ingredients for promoting liver and kidney health and to restore vitality, strength and well-being. According to a study from the Journal of Alternative and Complimentary Medicine, eating goji berry regularly can help increase energy levels, improve moods and improve digestive health, too. Participants who had goji for two weeks had improvements in terms of their feelings of “general well-being,” increased energy levels and better gastrointestinal function. Goji berry is traditionally known to have the ability to increase mood, to make one happy, reduce stress and fight inflammation. Goji berries benefit the reproductive system and offers increased fertility and increase sperm count and the vitality of sperm. Evidence shows additional goji berry benefits include treating female infertility in patients with premature ovarian failure and the inability to ovulate normally. 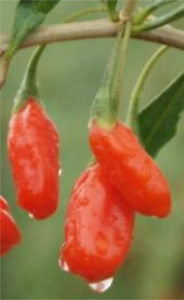 Results from a study done by the College of Public Health at Wuhan University showed goji protect against testicular tissue damage induced by heat exposure, raise antioxidant activity of superoxide dismutase in the reproductive system, raise sexual hormone levels and protect against DNA oxidative damage to testicular cells. These findings support the folk reputation that goji are effective for fighting infertility and old age. As a food, they’re traditionally cooked and used in recipes like rice congee, jellies and tonic soups and in combination with vegetables and other beneficial plant foods like wild yams. The berries are also boiled as an herbal tea and made into various juices and wines. The ‘Goji’ berry is known as a Tibetan berry because it was traditionally used in the Indo Tibetan Mongolian culture for centuries. The geographic area of this ancient culture once included Bhutan, all of Mongolia and a great portion of China, Tibet had much larger borders at that time. The traditional Tibetan medicinal plant collection areas remain in the same locations irreverent of political border and territory changes. The Tibetan Lycium berry ‘Goji’ was used in this ancient culture as a food because of its neutral energetic nature (neither cold or hot nature) and used in traditional medicines for the same reason because it could be utilized in a broad spectrum of Tibetan medical formulas. The Chinese wolfberry the Chinese manufacturers started calling Goji beginning around 1996 is Lycium Barbarum and is considered ‘ warm to hot’ and not recommended for use when having digestive weakness or spleen deficiency. ‘Goji’ is the name that refers to the Tibetan variety of Lycium that is indigenous to the traditional Tibetan and Mongolian botanical collection regions and used for centuries by Tibetan doctors and the nomadic people of those areas. Fairly recently, beginning around 1996 the name ‘Goji’ was ‘borrowed’ from the Tibetan culture and used to market another similar lycium berry known for hundreds of years as the Chinese ‘wolfberry’ and that caused market confusion and still remains a marketing error today. Harvesters and manufacturers are careful to distinguish the Tibetan Lycium variety true ‘Goji’ berry from its varietal cousin the Chinese Wolfberry (Lycium barbarum), pointing out that its hot, nutrient makeup and energetic qualities differ from the the energetically neutral Tibetan Lycium (Goji), as do the regions and conditions within which these two different Lycium berries are growing. The Tibetan Goji Berry Company is proud to continue to be a quality presence in the world Goji market and to have been part of the process of revealing Tibetan lycium to the world. We have been serving the world community for over forty five years now with supportive customer service and quality organic goji berries and medicinal botanicals. May there always be a bountiful harvest! Savor each berry individually or add to hot and cold cereals, blender fruit juice drinks, add a handful to your water bottle and eat them as you drink, use in trail mix, soups, salads, whole fruit and nut bars, baked goods, Goji tea and fruit juice blends and ice cream! Check out our recipe page page for more great ways to enjoy this special berry. Let your imagination SOAR with this creative culinary delight! Buy Goji berries Now! Click here.